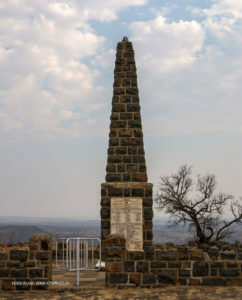 The battle of Hart’s Hill (Inniskilling Hill/Terrace) was part of the attempt to relieve Ladysmith and this battle commenced at mid day on 23 February 1900. 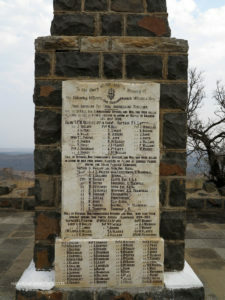 The Brigade had crossed the Tugela at Pom Pom bridge.The Inniskillings were first at the base of the hill and raced up forcing the Boers to retreat to their main positions further back and overlooking open ground.The Inniskillings found themselves pinned down and taking heavy casualties, which included commander,Lt-Col TMG Thackeray, and Dublin Fusiliers Lt-Col CGH Sitwell. 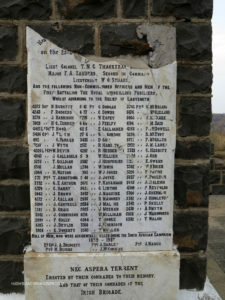 British casualties had reached 450. The British held their positions overnight and were reinforced. At this point General Buller decided to attack further to the right in order to take railway Hill and Pieters Hill. This eventually succeeded and the way to Ladysmith was clear. Both the Commander and second in command of the Inniskilling’s died in this engagement. View from Harts Hill towards Colenso.